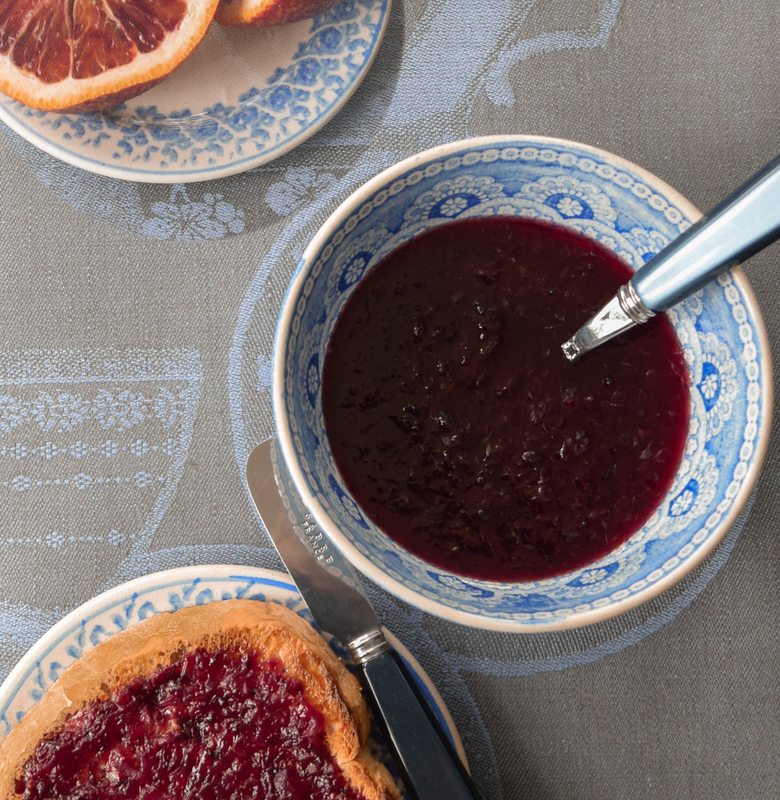 This Blood Orange Spread recipe is adapted from “Sarabeths’s Good Morning Cookbook” by Sarabeth Levine. Sara made a Mandarin Orange Spread, but I choose to use Blood Oranges since they are in season right now, and they are delicious and so beautiful. I, like Sara, peeled every white string from the oranges before separating the segments and cutting each one lengthwise in half. Sara said “ Slicing the segments exposes more of the flesh, so they cook quickly”. This spread needs to be kept in the refrigerator, where it can be stored up to 2 weeks. I know it will not last two weeks. Separate the oranges into segments, remove any white strings. You should have about 4 cups of packed segments. Cut each segment in half, lengthwise, check for seeds. In a nonreactive large saucepan, over medium heat, bring the orange segments and lemon juice to a simmer. Stir until the fruit breaks down and releases its juices, about 5 minutes. Stir in the sugar. Continue simmering, stirring occasionally, until the spread is slightly thickened, about 5 minutes. Using an immersion blender or a stand blender, carefully puree the mixture until almost smooth (return to the pan if you used a stand blender). Over medium-high heat, bring the spread to a boil and then reduce the heat to maintain a steady simmer. Simmer until the spread is thickened, about 5-8 minutes. Skim off and discard any foam on the surface. Divide the spread between 3 clean half-pint canning jars. Seal and cool to room temperature, then refrigerate up to 2 weeks.